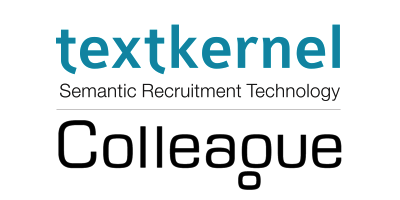 Colleague Software announces its partnership with the leading semantic recruitment technology company, Textkernel. Textkernel’s CV parser Extract! is integrated into their recruitment CRM Colleague 6 and will be offered as standard to their customers. Based in Amsterdam, Textkernel is an innovative, fast-growing software company that specialises in information extraction, document understanding, web mining and semantic searching & matching in the Human Resources sector. Textkernel’s products and services are used by more than 1,000 satisfied organisations worldwide. Textkernel’s CV parsing software converts unstructured CV documents into a structured, tagged format within Colleague 6. Documents can be parsed by importing a document directly into Colleague 6, or by parsing the email attachment within Microsoft Outlook using the Colleague add-in. “Colleague’s partnership with Textkernel is great news for our customers. Textkernel’s parser integration can offer a higher degree of accuracy, is multilingual and is maintained and regularly updated by Textkernel – utilising advanced semantic language technology and expertise.”, says Louis Welcomme of Colleague software. The partnership reflects Colleague’s long term strategy to integrate and work with the most innovative technology businesses that help make recruiters more productive, connected and intelligent in the way they work. For almost twenty years we’ve been driven by customer partnerships built on experience, knowledge and trust. Our customers have shaped and honed the technology they expect from us. Today Colleague is used by hundreds of specialist recruitment businesses who value software that is adaptable, efficient, relevant and easy to use. Textkernel specialises in semantic recruitment technology, providing multi-lingual CV parsing, job parsing, semantic search, sourcing and matching software and lead generation tools, to help recruiters make more placements faster. The company was founded in 2001 as a private commercial R&D spin-off of research in natural language processing and machine learning at the universities of Tilburg, Antwerp and Amsterdam. Textkernel now operates internationally as the leader in multilingual semantic recruitment technology.